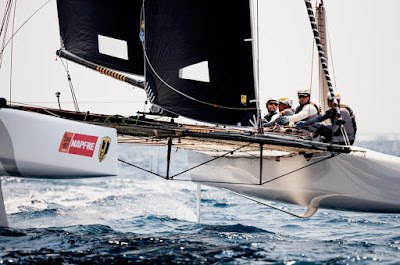 Ever consistent Bay of Palma gave the eight GC32 flying catamaran crews a more complete test on the penultimate day of the Mediterranean’s most prestigious multi-class regatta, Copa del Rey MAPFRE. Changeable conditions kept both competitors and race officials on their toes. Two races with windward starts in 7-8 knots were held initially before the race committee, led by PRO Stuart Childerley, moved to the top of the course for one round of the ANONIMO Speed Challenge and a reaching start third race in 12-15 knots. Then the wind dropped and the race committee was forced to revert to its initial set-up. Day three of GC32 competition here in Majorca produced yet more heroes. Star performer today was American Jason Carroll and his team of ‘Argonauts’. The longest serving team on the GC32 Racing Tour, Argo today seemed to own the race course, comfortably winning today’s first two races and leading for much of the third. While INEOS Team UK beat them overall today by a point, Argo’s 13 points were some 15 less than Zoulou, the next best owner-driver team, giving Carroll a healthy 15 point lead on the Owner-Driver leaderboard over Erik Maris’ team. Still far from the consistency they showed last season when they won the GC32 Racing Tour, Realteam posted some of their best results today, coming second in the first race and leading the final race, ultimately coming home second again. “We had a pretty good day,” said skipper Jérôme Clerc, slightly surprised as regular crewman Loic Forestier was injured sailing yesterday. 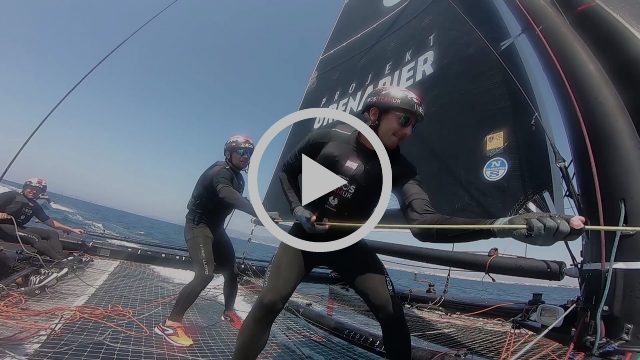 He was replaced today on headsail trim by experienced GC32 hand Christophe Carbonnières. The America’s Cup teams - INEOS Team UK and NORAUTO powered by Team France – still dominate GC32 competition at Copa del Rey MAFPRE. Even with Argo’s stand-out performance today, launching the US team solidly into third place, second placed NORAUTO remains 21 points ahead. However they trail the Brits by six points and this might have been less had Franck Cammas’ team not been OCS in race one, leaving them seventh. However it was NORAUTO, not INEOS, that won today’s final two races (INEOS claimed the third). Today’s ANONIMO Speed Challenge perfectly coincided with the peak wind speed and produced a new leader in Erik Maris’ Zoulou who recorded an average speed of 23.54 knots. Competition continues tomorrow for the final day of GC32 flying catamaran competition at Copa del Rey MAPFRE concluding with tomorrow night prizegiving where HRH Felipe VI of Spain will be presenting the trophies.